The following is page three of an illustrated proof for the sudoku.com.au tough puzzle of 01/30/08. Page two and page one attempted to finely detail how to find eliminations. This page will continue in similar fashion. This page, and perhaps this entire proof, has a theme: remembering what one has found. A second related, but not quite equivalent, theme is: fully noting possibility matrix changes. Hopefully, this page will serve as a sterling example of how remembering works for me. After each elimination, including cell solutions, I find it helpful to manually update my puzzle mark-up. This forces me to be aware of what has changed. Thus, newly stronger strong inference sets are noted. Often, I spend some time examining those newly stronger (meaning more restricted) sis. the mark-up above includes the result of step 3a: Locked 2s de7 => d9 ≠2. Note that candidate 8 required multiple updates. (8)ac9 both became circled. (8)e4 received an underline because of (8)e4=(8)ab4. The next step is the immediate result of those updates. Below, the Locked 2's elimination is graphed. Also, two different ways to achieve the same eliminations with candidate 8 are shown. b4=[row swordfish ace2, ae4, ac9] - a finned swordfish. a single candidate elimination search has been previously conducted. It has been argued by others that finding such groupings is beyond typical human pattern recognition. This is not only silly, but clearly only true if one chooses not to ever look for them. Finally, note the exquisite symmetry between the two chains making the same elimination: both have the same appendage that prevents a continuous, or wrap around situation: (8)b4. Furthermore, without (8)b4, both would have precisely the same targets. Somewhere, lurking within this symmetrical relationship lies a deep uniqueness of solution argument. But, I digress. Below, the new Bivalue (1=2)e7 plays an important role. Some may prefer two chains. Thus, the key to this one, for me, is not only recognizing the sis (1=2)hi2 created by the ALS(127)hi2, but more importantly realising that the new sis, (1=2)e7, and the old sis, (1=2)hi2, can be easily linked. Below, step 3c revealed an Almost Wrap Around Chain that is readily apparent if one looks for such animals. Moreover, note the overlap with the previous step. That is a lot of potential bang for the buck. 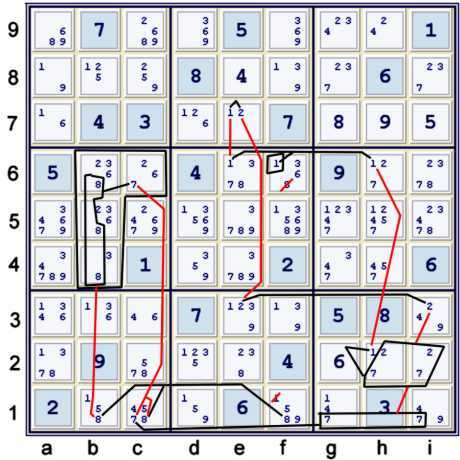 In my head, I recognize (7)gi1=(7)c1 because (7)c1 is underlined in the puzzle mark-up. 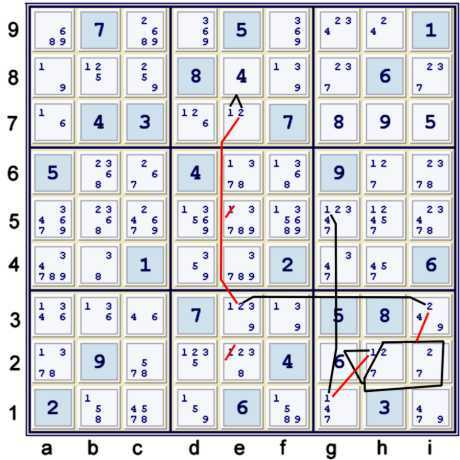 Thus, to remember this chain snippet, I note in the margin of my puzzle mark-up only: (1)f6=(7)c1. Since step 3c used four of the same sis, this shorthand is quite sufficient. Digression: After finding this chain, I noted that the elimination of (8) from c6 is not required to eliminate (8) from f6. Proving this is easy: (8)c6=[(8)f1=(1)f6]. Speculations about these sort of possible chains created the impetus for examining Almost Alternating Inference Chains (AAIC) .End of Historical Note Digression. 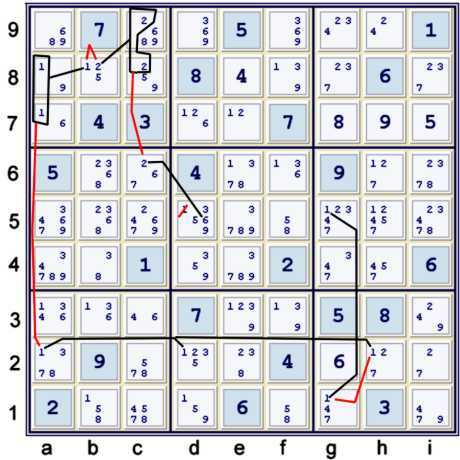 This requires a refresh of my puzzle mark-up, as now (9)d1=(9)i1, (6)d5=(6)f6, (8)f1=(8)f5. Circling the (6) at f6 and (6) at d5 provided an essential clue for the next cascaded step. At this point, I note in my puzzle mark-up both 1 & 2 underlined at b8. These serve as a clue for a helpful continuation to (6)d5=(2)c6. 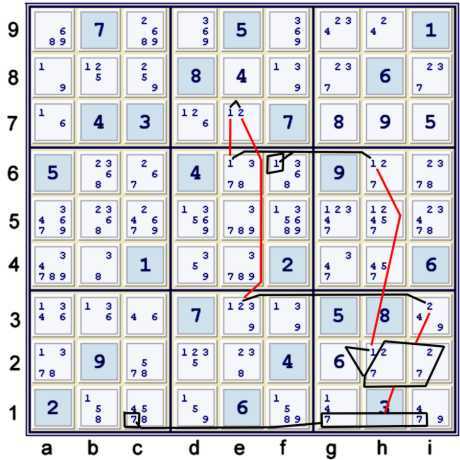 If one cares to, one can find a chain, depth 9, that replicates step 3f. 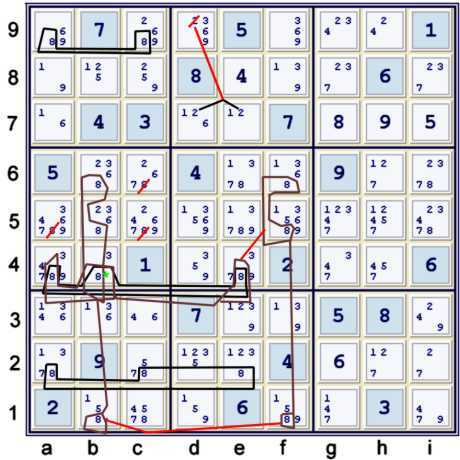 I generally do this, as it helps me to understand other things about the puzzle. I guess one could call that activity puzzle study. I find it often helpful. Here, my notes say D9 poss, meaning independent Depth 9 chain possible to achieve the same elimination. Independent means that it requires no knowledge of any previous steps. But, again I digress! 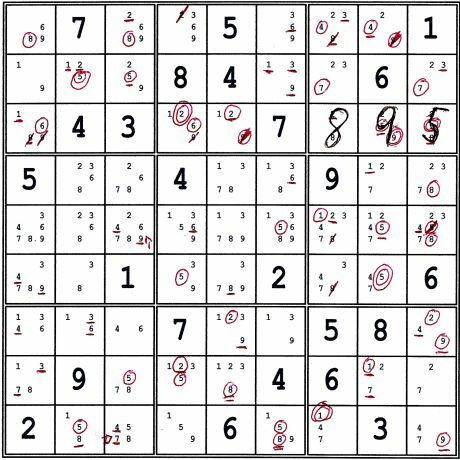 For reference and illustration purposes, below find an 8x8 Triangular Matrix that is actually depth 9. In bold, note that I treat the ALS(127)hi2 as a single Boolean:(1)h2=(pair27)hi2. This can be done freely without any loss of generality. Step 3h - ALS again. Although this elimination is in my scrap heap, I thought some may find it interesting in format. This step becomes available after (4)h9 because of the newly stronger 2's column h. This new strength is indicated by the underline one would place under 2 at h2, meaning (2)h2=(2)h456. This proof continues on Page four. Significant progress has been made.